By: David Noel Freedman, ed. The Eerdmans Dictionary of the Bible contains nearly 5,000 articles and explains every person, place, event and significant terms found in the Bible. It covers all of the Hebrew and NT Scriptures, including the Deuterocanonical books while examining matters having to do with biblical theology, text and transmission, extrabiblical writings and pertinent church traditions. 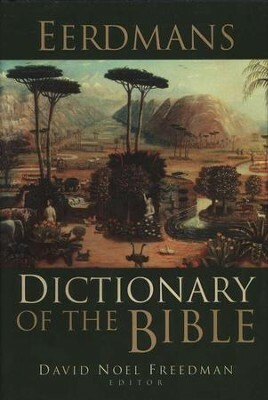 This dictionary draws on the latest discovers in biblical archaeology, includes insights from critical analysis of literary, historical, sociological, and other recent methodological approaches to the Bible, contains bibliographies featuring significant current research and focuses on topics important to Bible students at all levels, from general readers to specialist. Written by nearly 600 first rate authorities in the field it represents the spectrum of theological positions; and incorporates 134 information black and white photographs, illustrations and charts as well as a 16 page section of color maps. It has been designed as a rapid response reference work that is enchanced by transliteration and pronunciation keys on endsheets. "This volume is essential for every college library, and it would be a helpful tool  as helpful as any other one-volume Bible dictionary  on the desks of teachers and students of the Bible." "The Eerdmans Dictionary of the Bible is a new and outstanding one-volume companion to the Bible that every serious reader of the written Word of God should welcome. 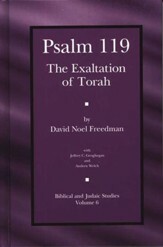 Editor-in-chief David Noel Freedman, along with a dozen well-known consulting editors and about 600 contributors, has made this dictionary an extraordinary compilation of data about the biblical books and their archaeological, geographical, and historical backgrounds. Many of the articles give good leads to further reading on the topics they discuss. Highly recommended for pastors, teachers, college and graduate students, and general readers." 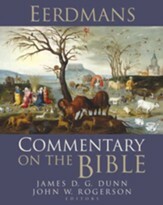 "Comprehensive, dependent upon scholars who themselves often represent the most up-to-date scholarship on the topics they treat, and filled with rich treatments of large and important topics as well as the lesser names and places that any such book has to include, Eerdmans Dictionary of the Bible is as good as one can expect from a one-volume Bible dictionary." "There are several reliable Bible dictionaries on the market. For reasons of space, none of them is exhaustive. But this is a fine addition that sets forth a vast amount of data useful to any Bible reader. Perhaps its distinctiveness lies in its frequent supply of theological material along with its scholarly and critical information." "In a sea of Bible dictionaries, the Eerdmans is a standout. It may just be the most comprehensive and wide-ranging of the one-volume dictionaries available. It more than fulfills editor David Noel Freedman's promise to provide 'a rapid-response reference work' that covers, in each of its entries, all the basic data, together with a concise, balanced, and up-to-date orientation to the issues. Indeed, a number of its articles offer fresh and authoritative, even provocative assessments by leading scholars in their fields. This is a dictionary that all serious readers of the Bible will want constantly by their side." "Superb. . . As the number of fine one-volume dictionaries continues to increase, this will certainly stand in the front rank of those which will be most useful to pastors, students, and scholars alike." "The quality of scholarship in this dictionary is superb, with contributions from the most senior scholars in the field and from some of the rising young scholars who will greatly impact the field. . . . There is no doubt that this dictionary will take its place as the most valuable and most used among those currently available." "Overall the Eerdmans Dictionary of the Bible is an excellent dictionary resource. For an audience seeking a guide to define terms, persons, and places, and a host of other issues in the Bible and its context, the EDB will serve extremely well. In its compact format it presents a wealth of up-to-date information that can assist beginning and basic questions related to the Bible." "This is the latest and now the best of the one-volume Bible dictionaries and should be a standard in church libraries." "Far surpasses such comparable works as The HarperCollins Bible Dictionary and New Bible Dictionary in the number of contributors and of articles, and it ranges more broadly across the theological spectrum. Up-to-date, comprehensive, and well written, the EDB is highly recommended." "Any serious Bible reader should own one of these one-volume mini-encyclopedias, and Freedman's entrant in this competitive field looks promising." "This highly useful compilation reflects current scholarly opinion on a vast variety of biblical topics and is characterized by thoroughness and clarity. . . A marvelously thorough resource, of great use in both academic and public libraries." "This volume should be considered by pastors who are looking for a high-quality, up-to-date, one-volume Bible dictionary." "Splendid in scope, reliable on facts, clear and easy to use." 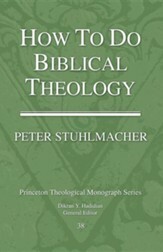 "The dictionary will be an invaluable tool for theological students and deserves a place in all theological libraries. It will also whet the appetite of the general reader for further biblical, theological and historical research." "The breadth of entries, the level of scholarship, as well as the helpful pictures, charts, and color maps make this an excellent choice for a one-volume Bible dictionary." "This is a major new biblical dictionary by reliable biblical scholars. It is ecumenical in its treatment of recent biblical scholarship which deals with biblical theology, text, transmission, extra-biblical and church traditions. It is recommended for all academic and public libraries?especially libraries supporting programs of religion, seminary, theology, and religious studies. This is a work pastoral ministers, preachers of the word, teachers and students of the Scriptures and theology would find handy and helpful. The price is very reasonable for a work of this quality and depth. It is highly recommended. " "Ideal both for 'spot' reference and for opening up areas for further study. . . It is a valuable resource for students, pastors, professors, editors and all who study the Bible in a serious way. . . The authors present an enormous amount of information reliably and concisely." "An important reference tool for reading and studying the Bible... Cultural, natural, geographical and literary phenomena are examined in a way that is accessible to Bible readers of all levels." "A truly helpful addition to your library." "Eerdmans Dictionary fulfills the need for a one-volume dictionary about as well as can be done. . . Friendly, helpful, and well worth the investment." "Here's a new Bible dictionary for a new century for reading, reference and study. . . Recommended for all congregational libraries." "Thanks in particular to the bibliographies, this will be a useful reference tool of first resort. " "This volume would be very handy for homily preparation and for anyone in a parish who might be teaching a Scripture course. It would also be useful for RCIA facilitators. Strongly recommended!" "Both editor and publisher deserve to be congratulated on this fine work." I'm the author/artist and I want to review Eerdmans Dictionary of the Bible.